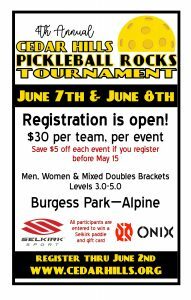 We are excited to announce our fourth annual pickleball tournament in conjunction with Cedar Hills Family Festival. 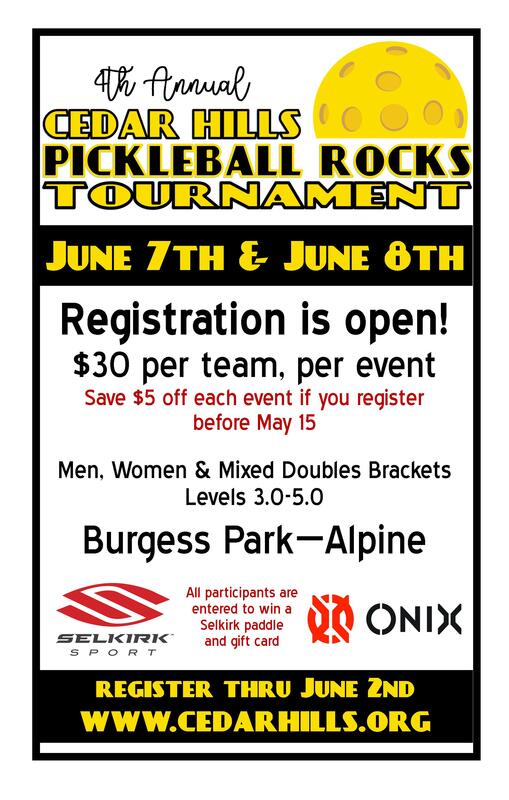 The tournament will be held at the pickleball courts in Burgess Park in Alpine. We will utilize the tennis courts, as well, so we will have eight pickleball courts for the tournament, which will be held on June 7 & 8 starting at 9:00 a.m.
We will have mixed doubles 3.0 to 3.5 played on Friday morning with mixed doubles 4.0 to 5.0 being played Friday evening. Women’s and Men’s doubles will be played on Saturday. Please register for both singles and doubles if you would like to play in both brackets. All participants will be entered into a drawing to win a Selkirk Amped paddle as well as a Selkirk gift card. Onix paddleballs will be the official ball used. Find all the details and pre-register online at REC1.com. $30 per event. Early bird registration is $5 off each event until May 15. Registration will end on June 2.